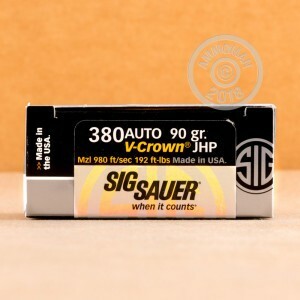 This premium ammunition from renowned gunmaker Sig Sauer features the V-Crown bullet, a hollow point design featuring two expansion cavities and a core-jacket locking band that promotes dependable expansion and penetration. 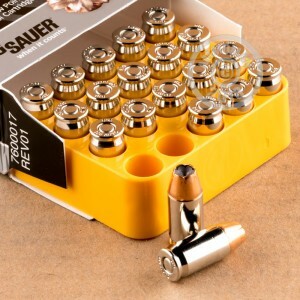 Each cartridge in this box of 20 fires a 90 grain V-Crown jacketed hollow point bullet at about 980 feet per second. Shop at AmmoMan.com for all your ammunition needs. Our longstanding policy of providing free shipping for orders over $99 makes it easy to stock up on multiple types of ammo at once! Sig ammo for my sig pistol, what more could you ask for?